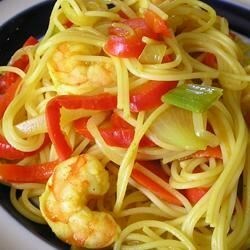 "Here is a somewhat spicy curry dish of vermicelli noodles with a medley of veggies and shrimp, chicken, and pork. It's an Asian way to clear out the fridge." In a deep skillet or fry pan, brown chicken, pork and garlic in the oil over medium-high heat. Reduce heat to medium-low, and add the onion, carrots and water; cover and steam for 5 minutes. Stir in celery and shrimp. Cover and steam for 2 minutes. A simple, comforting, and easy recipe for chicken and noodles. As I am a Singaporean, I, of course, love this tasty dish of noodles because this is a local dish. Thanks, Iron Chef-SuziQ! Great recipe. I added more water and soy sauce, along with snow peas and scallions. Thanks chef Iron Chef-SuziQ for this delicious dish! The more I eat it, the more I'm addicted to it!